A long while back, I did a review on chia seeds (which remains one of my most-viewed posts). In short, I found these healthy little nuggets to be palatable only in certain instances, but otherwise, the gel-ing was hard for me to eat. Recently, I learned that cold, gloppy foods like puddings and overnight oats (where you soak oats in milk overnight instead of cooking) were good homes for chia seeds. First exhibit: pumpkin chia pudding. I had leftover pumpkin from a recent vegan brownie expedition, so I snacked on the rest of can throughout the week. Here, I mixed a small 1/3 c of canned pure pumpkin, maybe about 1/4 c hemp milk, and 1 large Tbsp of chia seeds, along with some pumpkin spice and stevia. After mixing and a few hours in the fridge, I was pleasantly surprised at how delicious this was... literally like pumpkin pudding! Couldn't even taste the chia or gag at the gel-ing. In this case, it was GOOD gel-ing! For the dairy intolerant, this use of chia seeds is very welcome. :) Gotta play around with the combos some more, next time I'm on a health kick. I started regularly driving my lovely car (a 2006 Corolla, which doesn't narrow things down much in these parts!) in 2007. For years, I didn't do much driving because of no need to in college. But as I started graduated school, I bit the bullet. My dad got me the thing he has so far bought all of his daughters... a ride! Unfortunately, about three months after I started driving it, I found a gaping hole in the taillight cover one day. I freaked out, thinking I had done it. Without putting any blame on anyone, I found out later that I wasn't the one who had taken the car out when it happened. Whew... less heartache. Still, I had to live with this, and knowing I'd have to take care of it myself, I procrastinated until recently. See hole (and tape used over the years to cover up said hole). We did some testing to make sure it was installed correctly. Yay! It only took me 3.5 years, right? Also, I worked on something I haven't done in a while, either, which is clean the inside of my car. Dog hair had been hanging out with me in the back seat for months. I don't know if I have ever mentioned this on the blog, but I wear contacts. 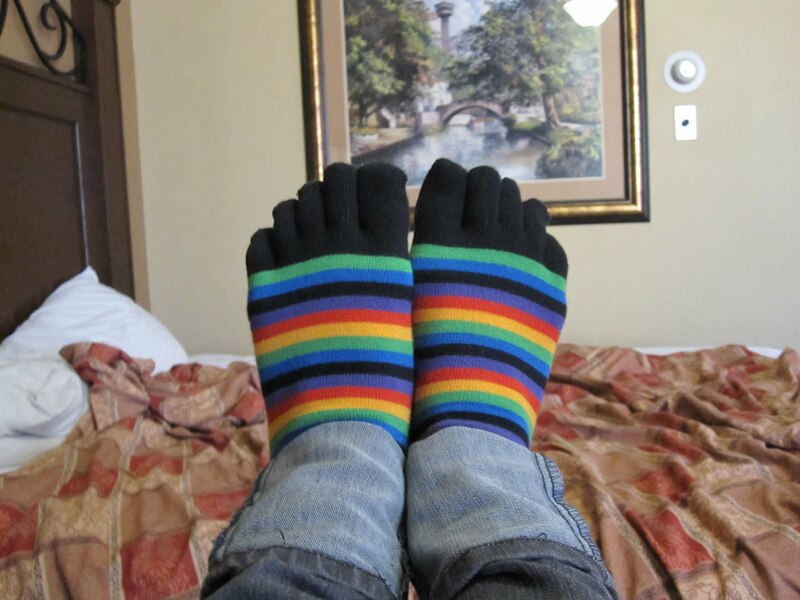 I am not ashamed to admit this fact, because I have come to the realization that LOTS of people wear them! It has been about four years since I got my first contacts exam. 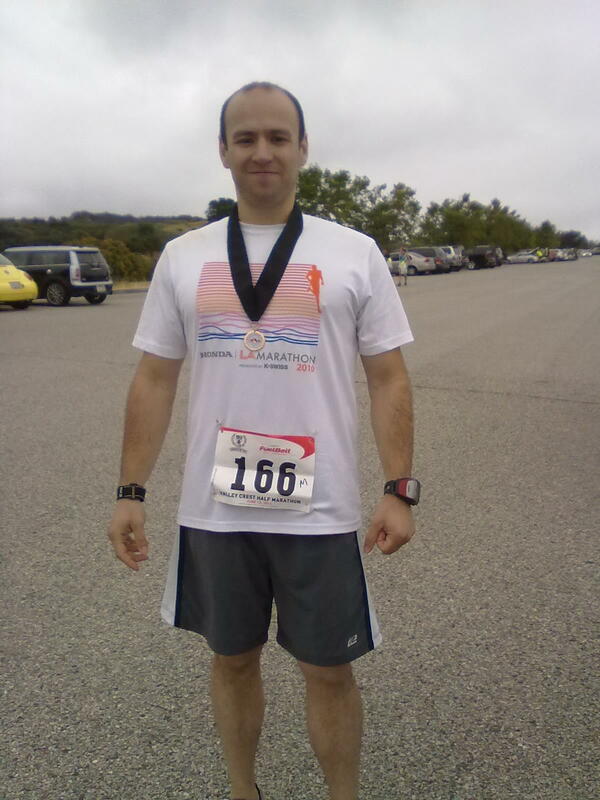 This was around the time I started graduate school and had completed my first marathon. Here's a little "before" shot of myself in my dear old spectacles. I've been wearing glasses since fifth grade, and had it not been for my stubbornness to NOT wear them, probably a few years sooners than that. I didn't feel badly about my glasses until I got older. 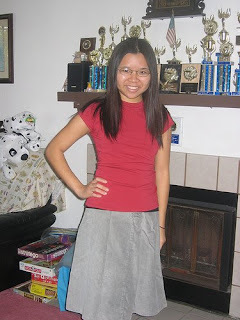 When I was younger, they were tools for sight, but as I came out of my teenage years, I felt they made me totally unattractive. :( How I wish that glasses were as cool back then as they seem to be now (e.g., "emo" glasses). But to put my sight tools in my eyes was a little too much. Running came to my rescue. I didn't run with my glasses on (to keep them from damage and from cutting my face), so I wound up squinting a lot. Sometimes, the bouncy blurriness of training runs gave me a little nausea, but not enough to stop me. Finally, my sister told me that I should just get contact lenses and save myself from the trouble. I was fearful, but then again, running had already made me become more daunting. After some rough times of learning how to put something in my eye and not let them get too dry (lest having a hard time getting them out, yikes! ), I started enjoying running even more because I could see... even better than with glasses. The lenses pictured above are torics, which are meant for people with high astigmatism like me (in other words, people with odd-shaped eyeballs). They are not cheap -- like 2-3x normal contacts -- and are to be changed monthly at best. In fact, my first year, they only had a YEARLY pair... ridiculous!! Anyway, they were/remain worth it. Given that I didn't spend my younger days eating out, I allow myself a little slack when I start thinking incoherent things like, "What do they eat in Peru?" I don't know why I say that's an "incoherent" thought... just something not well thought-out, because I use "they" like people in Peru are creatures from another planet or something. Love their cool menu! However, there weren't too many veggie options, though enough for me. Here's the comped bread and dipping sauces. All were mild and not too thick. I liked the one on the left the most. The green one, which I thought might taste like some kind of cucumber yummy dip, fell a little flat. "The Ukrainian" ordered Inca cola, which kind of tasted like liquid cotton candy to me. I ordered this vegertarian saltado, which I found to be really salty for some reason. Even though I had a long run the next day (yes, I'm way behind on posts because I am not doing any real "long" runs at the moment), I maybe had half of this, tops. Here's the same dish, but meaty. The decor was my favorite part of the whole experience! I burned my hand on top of "The Ukrainian"'s stove while flipping some kale chips in his oven. It was my first attempt, and they came out pretty good. How did I suddenly get into kale-chip making? Well, "The Ukrainian" bought a bag of kale from Trader Joe's. Not wanting to subject him to raw kale, I decided to make chips. First, I rip the stems off the pieces. Stems = no good. If you are using one tray to bake them, you probably only need about 1/4 of the bag or less. Do NOT cram the kale on the tray, or else they will crowd and not crisp properly. Remember that greens shrivel up, so this doesn't make very much more than what I show at the bottom of this post. If you want more, bake two trays. Then, a drizzle (1 tsp) of olive oil, a tiny pinch of salt, and a large pinch of nutritional yeast flakes. You can experiment with toppings (such as paprika), but do NOT overdo the oil. The kale should be very, very lightly coated. You can use tongs or your hands to distribute everything evenly. "Bake" at the lowest setting your oven can go. For me, it was 170 degrees. If you have a fancy dehydrator, even better. I set the oven at a minimum of 30 minutes, though it may need longer. Dehydrators will definitely take longer. It's all trial and error. You don't have to toss or flip in the oven very often, though I do recommend it (without burning your hand!!!). Here are the finished chips. They are crispy and don't cost $5.99 for a small bag! To go with this, I made rajma masala from the Happy Herbivore cookbook. As you can see below, I finally bought proper garam masala from World Market (love!). This recipe is more like an Indian-inspired chili recipe. It cooked up VERY quickly! When I added the garam masala, a wonderful, warm aroma wafted immediately. I served it was a sprout salad with rice vinegar dressing. For the dressing, I used 1 tsp of sesame oil, 1 tsp Bragg's liquid aminos, and 2 tsp rice vinegar. I've made mention of my bunion problem before. In this picture, I'm hiding it pretty well. I actually have a picture of my actual feet that you probably don't want to see unless you don't think bunions are abnormal. Whether I had started running marathons and such or not, I believe this was my destiny. First of all, it's karma -- I have been weirded out by feet forever. (Over the years, I have glad to learn that I wasn't the only one with this sort of aversion.) I guess all those jokes and such caught up with me. Second, here and there in the genetic pool of my family, women have had bunions, according to my parents. Ugh. Oh well. A college friend of mine (a male!) had an extreme case, to the point where his toes were crossing. He had surgery done, and now he's totally fine. While surgery is an option, it is often a last resort and isn't guaranteed to be permanent. Plus, all the running downtime! Yikes! Admittedly, it hurts. And no, I'm not referring to psychological pains of comparing your feet to other women's. Literally, I feel a throbbing pain in my shoes sometimes, or even worse, while I'm running. This relatively slight pain forces me to change my gait, which is probably no good. Given that my situation isn't extreme, or unusual, I just sort of live with the fact that my running mobiles are too wide for many shoes, and may sometimes get bruised (or worse), dry, blister-y, etc. I don't make a living through foot modeling, and I certainly don't go sticking my foot in people's faces. And really, they are fine, just not what I would expect from a "normal" foot. At least they work properly otherwise. I'm very grateful for them, even (or just) as they are. I've been on a book-reading roll lately! Even before I officially filed my dissertation (May 24), I was already starting to read "fun" books. Pretty much since my defense (April 27), I basically caved into reading like I would normally cave into a muffin. The Happy Runner sent me this book as part of a giveaway that I happened to win (yay!). I figured it would make good casual bathroom reading material. Basically, I don't really read diet books anymore. They are great for people who know little about nutrition, but these days, the Internet provides a plethora of information on specific questions one may have about staying healthy. Additionally, the tagline "The last diet you will ever need" was gimmicky to the max. 2) Drink water: I also agree with this, though if I listened to him, I'd be buying expensive water all the time! 4) Manage stress: Easier said than done, obviously! 5) Prioritize nutrients versus empty calories, especially Antioxidants: Sure, though he talks about MANY supplements in this book, which is obviously a marketing campaign. 6) Pray and meditate: Whatever floats ones boat is fine. 7) Sleep: I couldn't agree more! A lack of sleep can lead to poor decision-making in general! So unless you're deeply intrigued by numerous studies or want to read a tome of tips you probably already know, have a deep sense of the body/spiritual connection, or want to try some supplementation strategies, I think you could probably learn just as much about health measures online. I mainly blew through this book because I had a strong urge to read. ADDED: One of those weird things is losing all my side-links/feeds to all of your blogs. I'm trying to reconstruct it from memory, but if I've omitted yours (or would like me to add it for the first time! ), please let me know! I had the privilege of giving life. No, not THAT "giving life" (I'm a few years away from that, at least). I'm talking about blood donation, obviously! I was waaaaay behind on donations (a couple of years) and finally got to a training break where I felt I could safely do so. 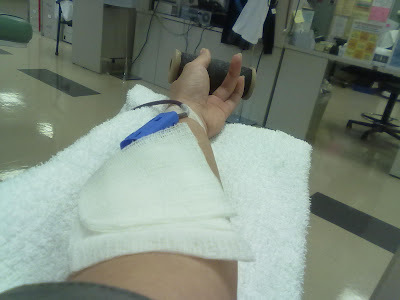 I blogged about donating blood as a runner a few years ago. Partly why I haven't been very regular about this is because I run, which is a shame. But then I remember that a good deed is a good deed. Paperwork will be there to greet you, which ensures you are eligible to participate and don't put things in the blood pool that *they* don't want there. Poor "The Ukrainian," by the nature of his "Ukrainian-ness," could not be with me. :( The checklists also ensure that you are healthy enough to give on that particular day. Then, a nurse will take your temperature to ensure you don't have a fever, take your blood pressure, and then a small blood sample. If you've ever done one of those mobile cholesterol tests, it's that same lancet-type deal that is really not bad if they do it right. My iron measured at 13, temperature a lovely 37 celcius, and blood pressure 100/66. A quick search on Dr. Google indicated that my levels were kind of barely high enough. And yes, donating blood causes the body to lose about 250 mg iron. However, the average iron tablet contains 45 mg (which I usually take in the period after donating). Knowing that I tend to have low iron levels, I made sure to eat plenty of greens, nuts, and dried fruit in the days prior to my donation and then buy the supplements for afterward. After what seemed like too long, I got hooked up. Admittedly, since it had been a while since I've done this, I was pretty nervous. The needle going in only felt like a pinch, though. 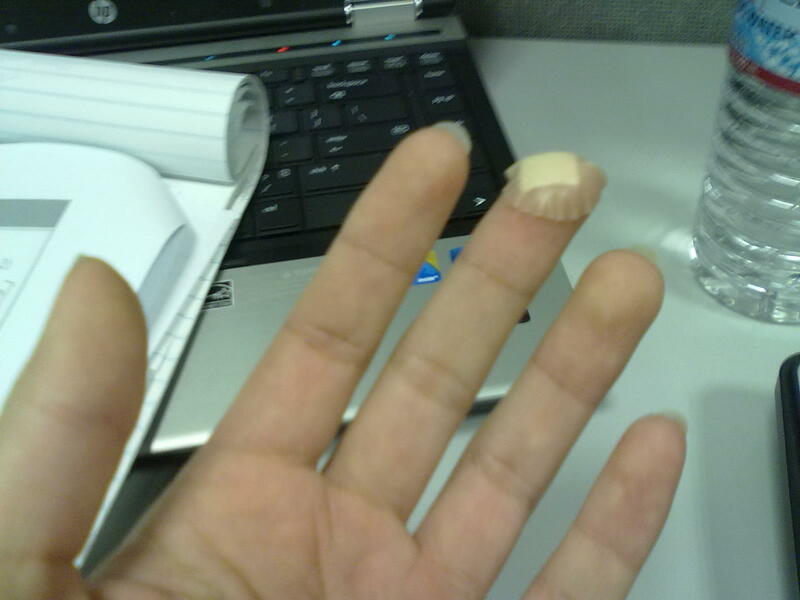 I had to roll and squeeze that object in my hand as I bled. I hate looking at myself getting stuck, so I just took a picture so I could look at it later. Too bad the blood bag didn't appear! It seemed HUGE and FULL of dark blood! You can see some of that lovely blood in that tube below. The tube was next to my hand, so I could feel the warmth of my blood going through it... uhhh, ewww? 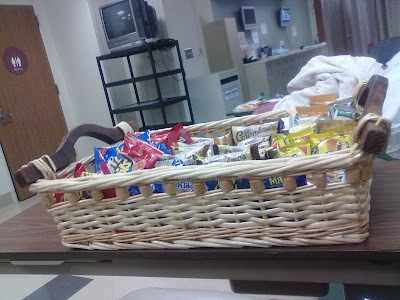 While I was taking longer to bleed than usual (probably because I was nervous), they brought over this consolation to me -- a basketfull of vending machine goodies! I definitely bled faster after that! :$ In total, I think I spent about 10 minutes rolling that thing in my hand and bleedin'. Afterward, I decided to chomp on the Kashi bar and Fig Newtons. I was tempted by other things, but I took a Teddy Grahams for the road. 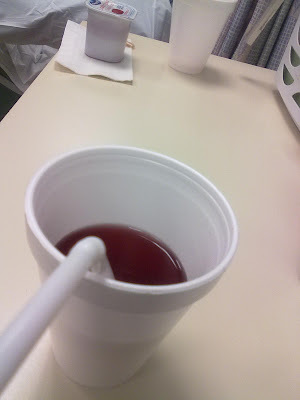 The rules say you have to stick around for at least 15 minutes post-donation, so I munched during that time. I sipped on this cold cranberry juice (from a choice of apple, orange, or cranberry) prior to my donation and afterward. Admittedly, I was feeling a little dizzy, but I think it was because I was nervous and hated being still. When my 15 minutes (not of fame) were up, I got up and left. The staff thanked me, and my feel-good deed was done! I got to choose my bandage color, so of course, I picked green. No removing this sucker for at least 4 hours, but knowing paranoid me, it hangs there longer. 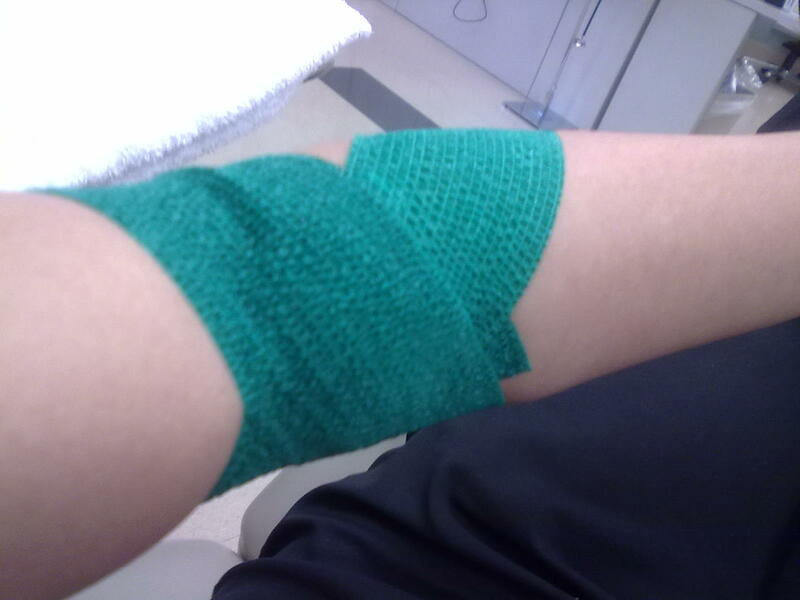 I wanted to snap a pic of my blood bag so bad, but it was whisked away. Now, according to my Aftercare sheet, my blood volume takes a few hours to return to normal if I don't skip meals and drink plenty of fluids as described. While I am not proud to be muching on vending machine snacks, I will take some consolation in the fact that I need it... as blood donations "burn" about 600 calories, I hear. The red blood cells should be back in 3-4 weeks, which is great, because my next marathon training program starts in a month. Meanwhile, I can resume my normal exercise tomorrow, though I might just rest another day since I have a graduation to attend. For my birthday, my sisters took me to brunch at a cute little place in Pasadena, CA called Central Park Cafe. This was brilliant, since breakfast/brunch is my favorite meal, and I'm a morning person!! My sister has already reviewed the place on her blog, but here was my take. This is a picture of the salmon benedict that my sister got. We all asked for our creams and sauces "on the side," because we're just a sad lactose-intolerant family. By the time the waiter got to the "normal" guys at the table who wanted their sauce as normal, he gave us the cocked eyebrow. My brother-in-law's ham, egg, and hash browns. This was my order: it is also a benedict, but it was on croissant bread. I wasn't blown away by any part of this, though I appreciated that I got to have some veggies. Even the egg wasn't poached as awesomely as the one I had in another benedict I've had. Mediocre food aside (was that too harsh? ), I really liked being out with my sisters in the earlier hours when I have more of an appetite. Thanks, sisters! I won a copy of this book from Britne in a giveaway she hosted a while back (thanks, Britne!). I read this book several months ago because it's a quick read. I wouldn't necessarily recommend this book to a pure beginner, but it does give some useful tips for both training and race day. Its goal is to get you to a 4-hour marathon, which seemed right up my alley because my PR is 4:19. My 10th marathon will be on November 12. While I am proud of this milestone, I am a little embarrassed that I have not been running such stellar marathon times as of late. Of course, finishing each race is stellar, but I start wondering if people in real life and even here on the blog take me seriously because I haven't cranked out this 4-hour marathon. Long story short, I was busy with school, life got in the way, and frankly, I stopped worrying about speed and more about getting through each race injury-free. It has been a while since I've followed a training program. I usually just do a couple of short runs per week, maybe a medium one (6-8 mi), and then a long one over the weekend. I didn't do any real speed work or mind my pace besides the "must go as fast as I can hold it." 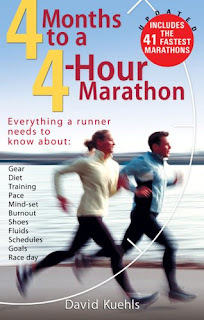 So I have decided to follow the training plan in this book, which also has plans for 4:15, 4:30, 4:45, and 5:00 marathons. The training falls into three phases: Endurance, Stamina, and Taper. I modified this schedule (which you will see more detail of later when I'm doing it) only slightly to accommodate some of the races I have during the training period. The Endurance phase contains the quarter-mile repeats, Stamina phase is more about hitting a certain pace on the medium-length runs, and Taper phase... well, you all know that's the part we love! The long runs go up to 23 miles, which is daunting, since my last 22-miler was humbling. Fortunately, the pace for all the long runs ranges from 10:40-11:20. But I tend to like to rumble through them more quickly because I don't want to be outside forever! Oh well, I'll figure it out. So my training officially starts on July 18th. I've already got my Google calendar set up with all the runs on it, which was a feat for me. I must really want this. And even if not, I think it will be an interesting experiment and challenge. I've figured out why Google Reader doesn't update with my race posts, and I can't figure out how to fix it without creating a bunch of dead links. So here is the link to my recap of the Valley Crest Half-Marathon. After running a half-marathon, it was churrascaria (Brazilian steakhouse) time! So given that I'm not good at buffets (especially meat ones), I think I made good use of "entry fee." They had a nice salad bar. As to not look weird, I snuck in this picture very quickly. On a brighter note, here's plate #1. The green circles in the background are the "Yes, please serve me meat" cards. I did not take any of the meat that the guys were coming around and carving. It was mostly chicken and especially lamb, making this place very Mediterranean. I did, however, take a carving of grilled pineapple (not pictured)! Highlights of this plate included the potato cake, smoked salmon, and eggplant hummus. My plate #2. They had an outdoor omelet and waffle area. They even had an egg white option! I put mushrooms, tomatoes, and onions in mine. I also asked for a (salty) potato off of their grill. I had to also steal a Belgian waffle with strawberry sauce, which was pretty much my dessert. "Ukrainian" plate #2... plain eggs (guess he didn't want an omelet) with ribs and other samplings. I've stayed away from trail races. It's not that I don't like a challenge, but I figure that I can't even master road racing!! 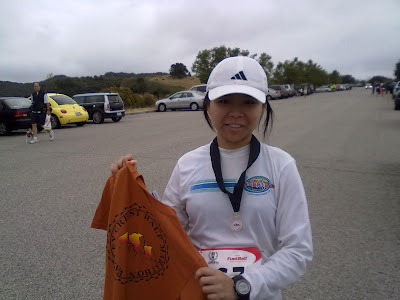 I once did a hybrid trail/road half-marathon at the Rose Bowl and liked it because it was "different." "The Ukrainian" had been hinting that he wanted to do a trail race. I finally pulled the trigger and forced both of us into this. even if Fargo (5K + Marathon) was only a few weeks ago. Pre-race dinner was semi-homemade sopes (remember?! -- posted the pic again below)! So above is the lovely elevation profile. All things considered, I didn't do TOO badly. 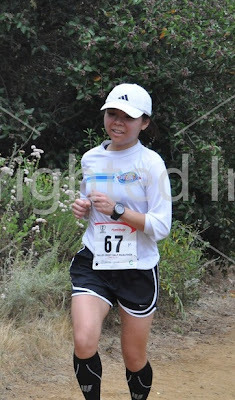 The race started off with a steep uphill and the few miles after that, I was feeling really good. At around Mile 3.5, we turned around, only to do a 3-mile death march up an everlasting hill. I was breathing obnoxiously loudly because of the thinner air, and with no earphones encouraged, I was left to listen to it. Overall, I did a lot better than I thought I would do. The weather was completely in our favor -- misty, not too windy, and pretty cool. The terrain wasn't very easy, gravel, loose dirt, and rocky areas necessitated the need to jump and weave, not to mention avoiding the users of the trail since the course was not "closed." The aid stations were decently spaced, but on a hotter day, I could imagine I would have crashed and burned. When I finished, we went for watermelon and oranges and then waited around for the awards ceremony. With about 400-ish racers, it was small enough to want to see what some of the winning times/age group times were. Had I been just a couple of years younger, I would have won the 20-24 F age group... *sigh* I was disappointed that they did not reserve a tech tee for me (see the cotton orange shirt above), even though I had signed up for one. They claimed that they "ran out." The tech tee was a bright neon color, anyway, so I guess it was okay... I guess in order to get the shirt I want, I need to run faster next time. Also, check out the coin-sized medal. I don't mean that sarcastically... I found it cute. I'm not sure how I feel about trail races now that I've done a real one. I definitely felt less beat up than after running a "normal" half-marathon, even though I know my hips will be sore tomorrow due to keeping my footing. Thank goodness that I have a decently strong core! Half-marathon #18 is now done... I'm actually going to reach 20 this year, if all goes according to plan.